WOOLWICH TWP. — A Functional Living Program for students with unique learning needs has been implemented at General Charles Harker School in Woolwich Township. The goal of the program is to teach students how to live an independent life on a daily basis through instruction and modeling. Goals for the students are organized into groups including dishes, laundry and clothing, housekeeping and chores, household mechanics, cooking, and kitchen. The goals for this program are based on The Assessment of Functional Living Skills Guide in conjunction with each student’s individual needs. This program is made possible through the collaboration of the SWSD Special Services Department, teachers, administrators, paraprofessionals and other staff members. Mrs. Jan Hill is the Special Education Teacher assigned to the program. According to Hill the implementation of the program is possible because of this team effort. Occupational Therapist Stephanie Sparks and Speech Therapist Lauren Ryan were instrumental in the planning. Paraprofessionals Sonia Hamaty, Anne Dorety, and Crystal Thompson also play a key role in the program. In addition, donations of materials, appliances, and furniture made by staff and community members made it possible to create a realistic home living environment for the students to learn and practice skills. The idea of creating this program began with Hill’s experience teaching students with unique learning needs. She found that her students enjoyed hands on, practical tasks that show student success immediately. The immediate feedback of success resulted in the increase of confidence and pride shown in student work. 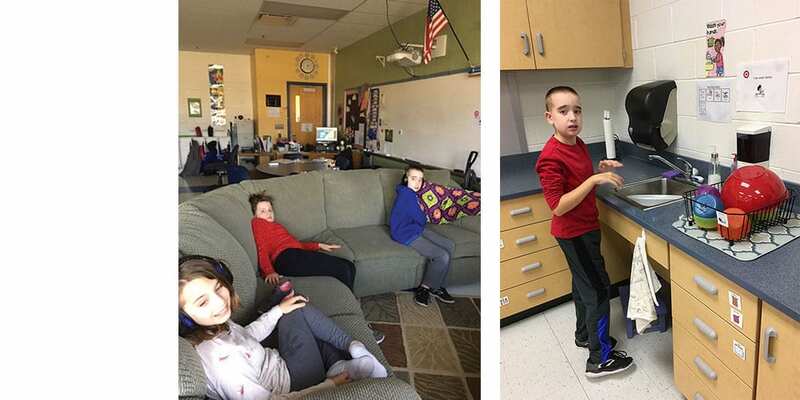 After observing the students’ excitement, Hill began to think about how a Functional Living Program would create new learning opportunities for the students that teach real life skills. Hill spent time on research and observation of existing functional living programs. Next, she developed an outline of her vision for the new program. One main feature of the program at Harker School is a work area that is similar to an apartment. Hill wanted the “apartment” to be as realistic as possible. A wish list of items needed to furnish the apartment was created and staff members were asked to donate the items. The SWSD staff responded generously by donating items and working on the construction of the area. The strength of the program became evident as soon as it began. New opportunities for learning both academic skills and life skills are being added regularly. One such addition is The Comet Cafe. The Comet Cafe is a coffee shop for staff members; students are required to use multiple skill sets while working in the Cafe. Students practice organizational and math skills while also developing communication skills. When working in the Comet Cafe students need to communicate with their customers. This offers the perfect setting to use these skills in a real world setting. As the program continues to evolve, Hill plans to add academic goals to the functional skills goals. Because each student’s learning goals are individualized, the flexibility to instruct students in the setting that best meets their own needs is necessary. Instruction for the academic goals can be addressed in either the functional setting or the individual one-to-one setting depending on what works best for each student. Wowww Congratulations EVERYONE. Jan Hill you are amazing, I have known that for a lot of years. I’m so very happy that you chased your dream. You are such an asset to that school district. In the beginning you had your job, you raised your children, worked so that you could be with them, and when they were at an appropriate age and you were somewhat finished raising them you moved on to your next dream. Not many folks would do that Jan, you did it with courage and confidence. I being your friend and knowing you for some 25 years am so very proud of you and the woman that you are. Good luck to this program and good luck moving forward.